Temple of Thelema • View topic - "Until we are actually on that voyage..."
"Until we are actually on that voyage..."
Here's today's Facebook quote from the local Jungian Center. I like. "Jungians such as Joseph Campbell have generalized... journeys into a set of archetypal events and images. Though they can be useful in criticism, I mistrust them as fatally reductive. 'Ah, the Night Sea Voyage!' we cry, feeling that we have understood something important — but we’ve merely recognized it. Until we are actually on that voyage, we have understood nothing." Re: "Until we are actually on that voyage..."
Yet underneath that mask was a Hero with a heart of gold. Don't know if anyone is familiar with Ursula and her fantastic books, but she is a notable fantasy science fiction author who is able to push conventionally held archetypal stereotypes to new boundaries. Highly recommend her works, as well as Joseph Campbell. JC's works were very enlightening as well as entertaining. Oh, come on, Kasper. 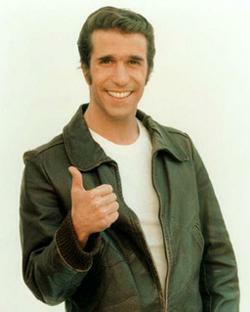 Everybody knows that was just an electrical short that Fonzie knew how to take advantage of. The magick in it was that the song that would play would always be synchronistically appropriate. Makes me wonder how much I missed because I thought it was just a short and wasn't expecting anything like that to happen..